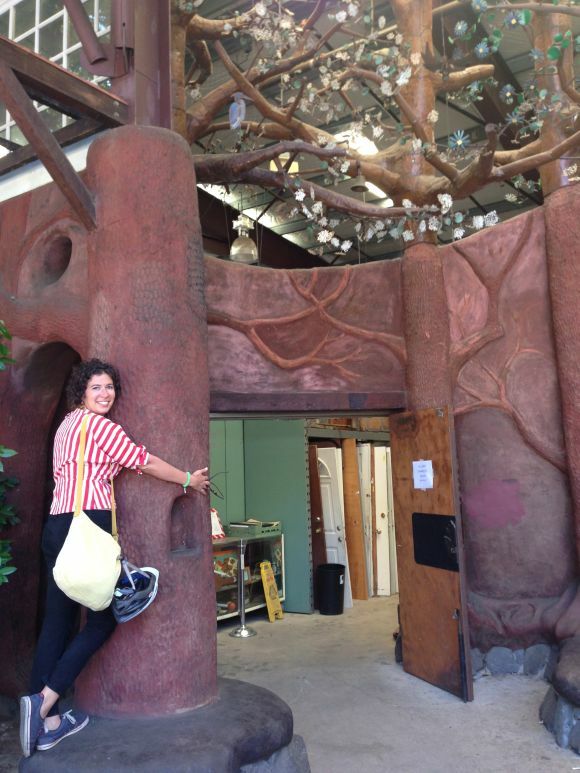 From Village Building Convergence in Portland to Creative Place-Making In San Diego? Last month, Beryl Forman and I successfully launched the bi-national “Take Back the Alley” initiative in San Diego and Tijuana. These types of community-build projects are starting to gain traction in our region, but there is a lot of room for growth. 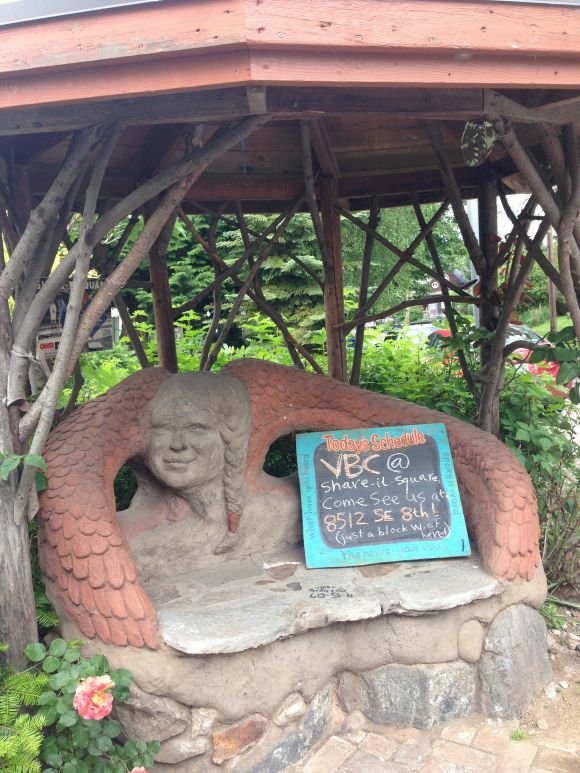 So in an effort to learn more about sustainable place-making and build momentum for future projects in our region, we headed to Portland’s Village Building Convergence (VBC), where the inspiration for “Take Back the Alley” first germinated. 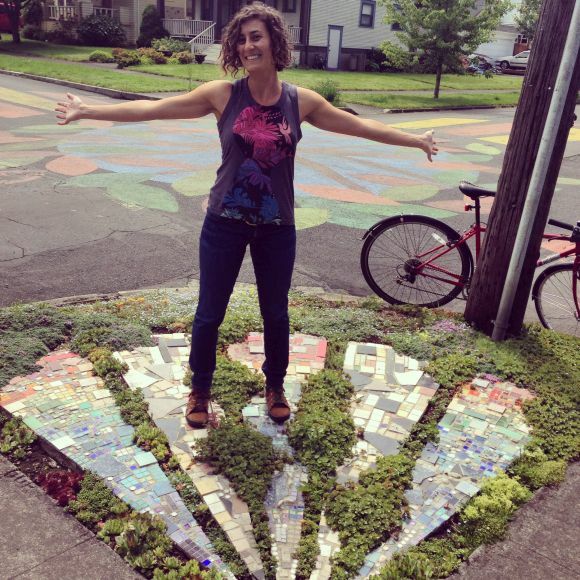 The Village Building Convergence is an annual event organized by City Repair, a local group in Portland that educates and inspires communities and individuals to creatively transform the places where they live. At the VBC, people of all ages and backgrounds work on projects together in neighborhoods throughout the city for ten straight days. During this time, neighbors construct benches and community kiosks, plant gardens, paint their streets, lay down tile mosaics, and more. They learn important skills around urban sustainability and social equity, while celebrating the creativity and diversity of their city. 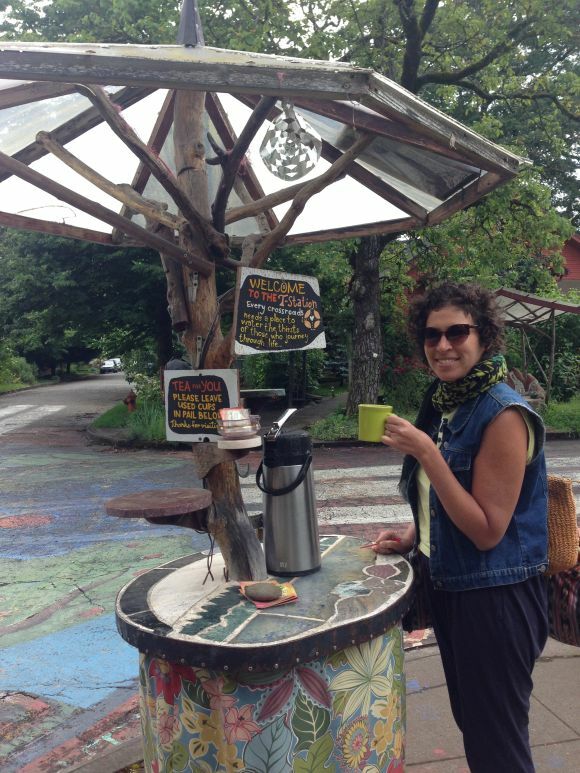 Our first stop in Portland was the site where these community-build projects all began, the Planet Repair Institute, which is also the home of VBC founder Mark Lakeman. As activists, Mark and his colleagues recognized a need to bring neighbors together to spark conversation about ways to implement innovative building practices that fundamentally defy the restrictive nature of our current built environment, which is modeled after the Roman grid. They started simple, by providing free dessert and inviting neighborhood folks into their sustainably built tea house, located in Mark’s backyard. Within months, over 100 people were showing up each week, bringing their own desserts to share. Around this time, as neighbors were beginning to establish greater connections and discuss community issues, two young girls were killed while crossing a nearby road. 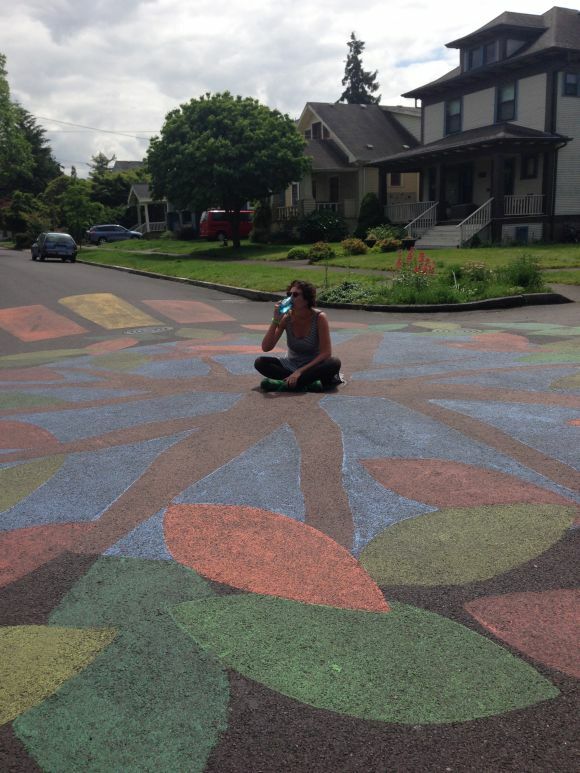 This incident galvanized the community to focus on creating a safe and accessible gathering space in their neighborhood, and thus the first painted intersection, Share-It Square, was born. The tea house, which facilitated regular communication between neighbors, served as a way to build capacity for future development of more and larger public gathering places, modeled after the zócalos and piazzas that exist in most cities throughout the world, except in the United States. As we stood in Share-It Square on our first day in Portland, Mark explained to us that all great public gathering places have a few vital components including a place where drinks are served, public seating, an information hub, a space for intellectual stimulation, and a place for play. Interpretations of all these elements can be found at the various painted intersections that the Village Building Convergence has created throughout Portland over the past 14 years. The two most notable intersections transformed into rounded plazas are Share-It Square and the Sunnyside Piazza, which both feature elaborate murals on the ground, a tea station, a lending library, benches, information kiosks/newsstands with living roofs, planters and cob structures, all artistically designed to reflect the character of the neighborhood and bring people together. While not all of the reformed intersections contain all of these features, they all participate in the ongoing practice of re-purposing their street by painting the intersection. This annual practice has now expanded from one intersection to over 40 different community-build projects throughout the city of Portland. In an effort to capture the full experience of this convergence, we borrowed bicycles and set out to visit the various sites and familiarize ourselves with the city, which is noted for its active bicycle network. Thankfully the San Diego sun followed us to Portland and we had two wonderful days of traversing the city quadrants via bike boulevards, cycle tracks, well marked roads that cater to the comfort and safety of cyclists, and protected bike lanes on streets, over bridges, and along the beautiful river pathway. Aside from the many painted intersections, permaculture and urban gardening projects have become another major component of the Village Building Convergence. One garden that we visited, called the Kazuko Garden, is part of the Urban Farm Collective which is unique in that rather than dividing up the garden into individual parcels, the land is worked by volunteers who trade their hours of service for credit in a community market where the harvest in distributed. In addition to the project sites, Mark also recommended that we visit the ReBuilding Center, an integral supporter of the VBC. Their mission is to “give the community a way to honor used building materials from our past and help preserve our future through creative home repairs and remodels, art and construction projects.” On the inside, it is a huge storeroom of recycled tools and appliances that can be used by the community, and on the outside their storefront is fully outfitted with a magnificent cob shaded seating area in the shape of a tree. Another site that we visited, called the Manifestation, truly took the mission of the ReBuilding Center to heart as they turned an abandoned warehouse by the train tracks into an Art Refuge Sanctuary where creativity and community flourish. 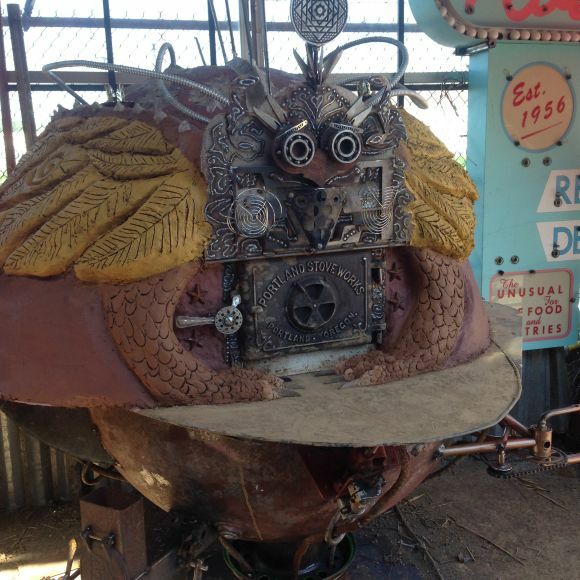 In just one year, a group of mixed media artists and innovators transformed the space into a mecca for sculpture, metal fabrication, bike building, sewing, glass blowing, music making, painting, sewing, and gardening. And on top of all that, as part of the VBC, they gathered volunteers to help build a communal cob pizza oven. A large component of the Village Build Convergence is the evening activities that galvanize the community to learn from each other and inspire further collaboration and good will. So we took the opportunity to join community village builders and their famous tea horse (a free mobile tea station) at the highly regarded Alberta Street Fair, the largest art event in Portland which takes place on the last Thursday of every month. As a way of returning a positive sense of community to NE Portland, which was once a rundown and forgotten part of town, members of the business district decided to capitalize on its creative community by allowing anyone to set up shop or perform at this street fair. Seventeen years later, Alberta Street is thriving and the 10-block long street fair is packed with an extraordinary array of musicians, food vendors, artists, and local businesses filled with happy customers. To our surprise and delight, the tea horse turned out to be just one of many tantalizing displays of uninhibited creativity. A good time was had by all, and it certainly appeared to be a grass roots model that could be applied to any one of San Diego’s unique business districts. On our last day, we ventured to downtown Portland to gain more insight into a variety of innovative approaches to urban development. One thing in particular that really impressed us was a formerly vacant lot turned into a legal homeless encampment called “Right to Dream Too” which is nestled right up against the famous China Town gateway in the heart of downtown. Two years ago, a group led by formerly homeless people was granted permission to turn this lot into a safe space for homeless folks to sleep. The lot is protected by a wall made of old painted doors and there are volunteers monitoring the entrance. 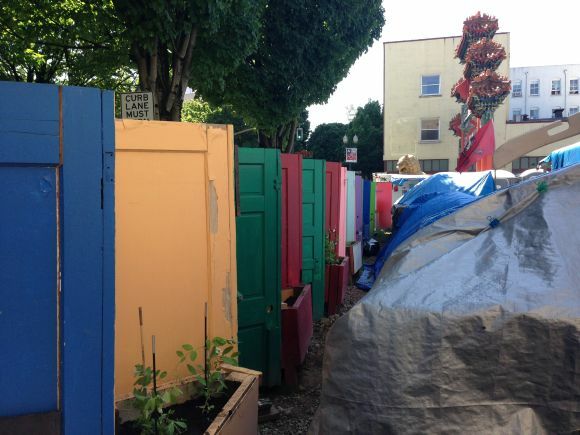 There is a collection of sleeping bags and clothing, a food pantry, an assortment of shared bikes, a budding community garden, and even a tent with shared computers. 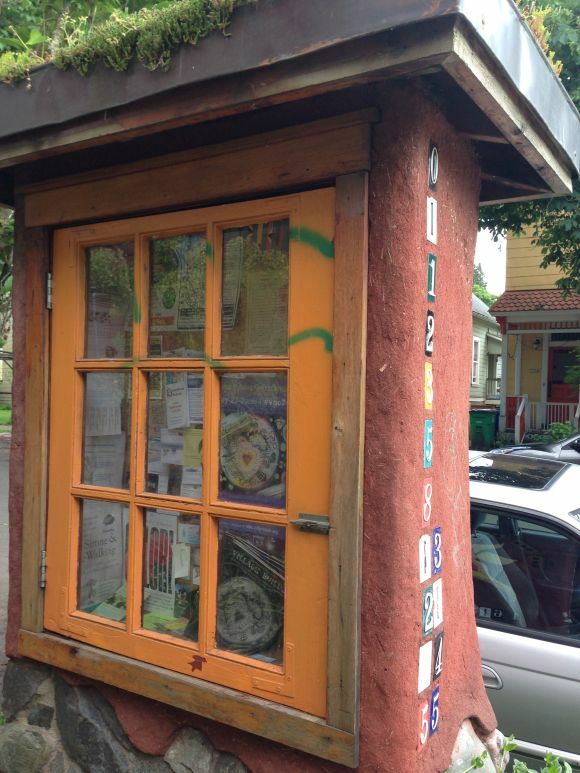 Overall, our visit to the Village Building Convergence and the City of Portland was nothing short of inspiring. We hope that we can share our new knowledge with colleagues in San Diego and adapt these models to meet our needs in San Diego. These interventions do not have to be complicated and costly. Sometimes it just takes the right partners, a little paint, and lots of imagination. Avital Aboody is the Project Coordinator for BAME CDC, which strives to strengthen and rebuild the fabric of the community through business, community and economic development. Beryl Forman is the Marketing Director for the El Cajon Blvd Business Improvement District, which includes North Park and City Heights. She is currently working on her Master’s degree in City Planning at SDSU. “The truth is that nobody has, in this matter, faced the fundamental problem; which is not so much the nature of Mr. Epstein’s sculpture as the nature of any sculpture. Sculpture is normally a public and monumental art; and the real question raised is whether any art can be public or ornamental. Granted that any artist may have a conviction that he is right, the question still remains: why should he stick it up in stone to be stared at by all the people who are certain to think he is wrong? The truth is that the whole conception of a public monument comes down to us from times when men did not feel this immense distance between the craftsman and the crowd. If they had, they would never have set the craftsman to work solely for the crowd. In that case there would never have been any such trifles as the Parthenon or the Cathedral of Seville, let alone the more important products of the modern artists of the moment. Great article! Thanks for sharing. Feeling inspired. Excited to see more of this come to SD.